Being a film student often gets a bad rep. Even so, there are plenty of schools in the United States that cherish the art of filmmaking, with many lead the industry in creating standards for film practices. 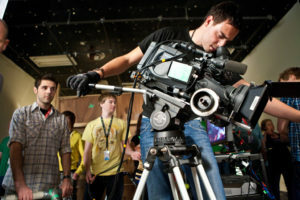 We researched and found a list of the Top 10 Film Schools in the United States. The schools listed and ranked were based on programs’ notoriety/alum success, and their opportunities for success during and after graduation. To kick off the list we’ll start with number 10. Hosting a local film festival in LA every year, Emerson College has such a great understanding for networking in the film industry. Their internship program sets them apart. Students of Emerson often land great internship gigs with big names in the industry. The community that Emerson creates make great internships for students never-ending. With the rich history of Texas as its backdrop, it is no wonder that the University of Texas at Austin’s film school would be great. Many notable alums keep the UT name alive and well. L.A.M.P. Media’s own Andrew Poppoon studied film at UT before making his jump to New York. It is a great school, and one of the cheapest on the list! Hook’em Horns! Known for the animation greats that hail from here. California Institute of the Arts is another great college to look into when searching for potential film schools. They offer a Film and Video degree, aside from being known for their animation programs. Loyola Marymount University is a small school with a lot to offer. It is a competitive school to get into, but once you’re in, there are endless opportunities to succeed. Additions are coming to campus to accommodate the growth that it is experiencing. An Ivy League school sounds great on a resume, doesn’t it? You have the chance to learn from some of the best, at one of the best universities in the country. Columbia University offers the MFA while just the name alone holds weight. Who wouldn’t jump at the opportunity to attend this school? Take it from the success of two of their now famous alums, the Duffer brothers (Netflix’s “Stranger Things”), Chapman is not a university to be overlooked. Starting from an undergraduate level, you are allowed to specialize in a specific field of film. Chapman is completely immersive and has its OWN production company. Students handle the marketing, and distribution of their films, making it a more well-rounded program. Although it is not as specialized with the program offerings as the others listed, UCLA still holds a lot of industry weight. Each year, about 30 students are admitted into the program, if you wanted to get a feel for your competition and odds. Being in the heart of California, and the film industry, it is no wonder why this school is ranked in the Top 5. Film is what California does, and what better way to learn than in the state itself. AFI is not your traditional college. It offers certificates to those who have not yet received an undergraduate degree, and a masters degrees to those who have an undergrad degree. Additionally, AFI hosts their own film festivals that allow students to showcase their work. The school offers endless opportunities for students to make a name for themselves while attending. You can learn from the best, and be a part of the very successful and heavily nominated alma mater. More focused on the art of independent filmmaking, NYU offers the second best program in the country. They strive for their students to be creative and to create their best work in a city as rich in culture as New York City. With all the opportunities for internships for big name companies, NYU is one of the best places to head to if you want to make a name for yourself in the film industry. When you think of filmmaking, you think of California. Everything is there—Hollywood, the beach, cities—and the resources are in abundance. USC continuously topped the list for almost every film school ranking that there was. It goes without saying, that USC is top-tier. Located in Los Angeles, California, it acts as a hub for endless talent, and Hollywood loves to employ USC’s alums. Be mindful though, the school is extremely selective, with only 3% of all applicants being admitted into the program of Cinematic Arts. However, don’t let that scare you, if you have the talent, try and get into the best film school in America. Although these schools are all competitive to get into, but the knowledge and skill that you obtain while attending anyone of these universities is priceless. Hopefully we made your search a little easier, and who knows, maybe you’ll be one of their famous alum one day.